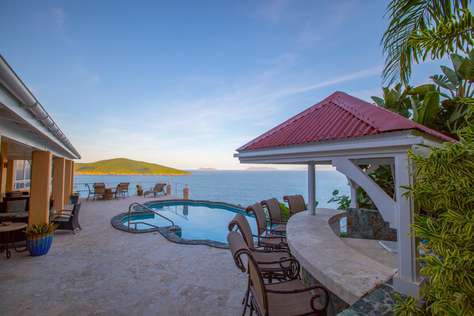 Enjoy the views and unwind in the breeze at Villa Viento - a sprawling 5 suite compound that welcomes you to the seaside cliffs of St. Thomas. 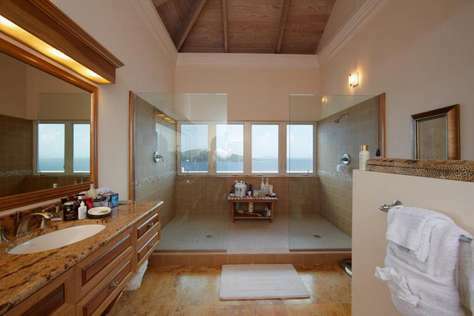 Villa Viento is a tranquil and exclusive vacation rental on the Peterborg Peninsula of St. Thomas. • Dedicated and personable concierge services! 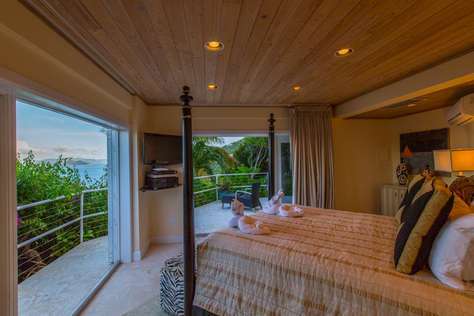 Relax and unwind at Villa Viento during your Virgin Islands vacation! Please note: We highly recommend 4 wheel drive vehicles, as the driveway is steep and can be slick when wet. This property has 1 Pull Out Sofa(s), 3 King(s), 2 Twin(s), 1 Full(s), 2 Bunk(s), 1 Trundle Bed(s). We stayed at Villa Viento the week of June 25. The pictures online look incredible but they don't even come close to what this property looks like in person. The house itself is gorgeous with every amenity you could think of. The five private bedrooms separate from the house are a plus. We never once felt like we were disturbing Those in our party. The pool and lounge area are perfect for sunbathing or just relaxing and looking out at the surrounding islands. I cannot say enough about this property and the property manager, Amy. She took care of everything we needed, whether it be dinner reservations, tours, or just information about the islands. I highly recommend this property and Amy. This is my fifth time visiting Villa Viento and it never gets boring. The location is great, views are outrageous, nice gentle trade wind and the sleeping accommodations are superb. Property manager, Amy, was extremely helpful making us feel comfortable with the property and making the most of our vacation with excursions and dinner reservations. Villa Viento is the total package......The best getaway ever!! My stay at Villa Viento was outstanding. The main house consisted of three spacious airy bedrooms that were connected to a magnificent kitchen and a large great room that spilled out to a patio that encompassed a refreshing swimming pool. The view of the water from each bedroom and the pool and patio was spectacular. The hot tub was extremely inviting and private. The game room was fun for all ages with two bunk beds which were ideal for kids and teens. The honeymoon suite had another fantastic view and was romantic and private. The entire villa is located behind a coded security gate and is completely safe. A golf course and several fine restaurants are located just minutes away making Viento very convenient. I thought the entire experience of Villa Viento was top of the line and superb. I cant wait to return and spend more time at this paradise location. Our stay at Villa Viento was exceptional. The view was breathtaking anytime of the day or night, while the bedrooms were spacious, comfortable, private and clean. The main floor was open concept, We could cook, swim, dine and relax anywhere on the main floor and be together and view the surroundings. For privacy, there were plenty of bedrooms and a game room which was so much fun after dinner. Golf and fine dining was so close- well worth venturing out....Our family was reunited, great vibe, sunshine and happiness. If you don't have a good time at Villa Viento it's your own fault. We can't wait to go again next year for another great week in paradise. We had a work retreat at this gorgeous property in January. The pictures look incredible but truly do not do the property justice. By far, this is the most exquisite and beautiful property I have ever stayed at. 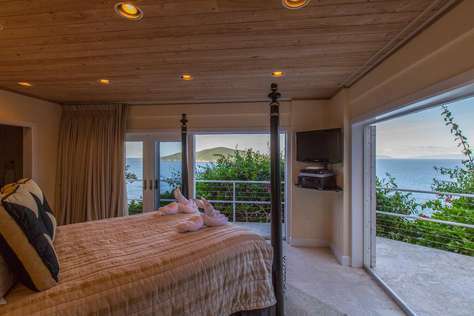 Each room has a spectacular view of St. John and several of the British Virgin Islands. The rooms are decorated beautifully and the property is kept immaculately clean. The layout of the house is awesome and I love how the main house has the kitchen, dinning room, living room and a bathroom and all of the rooms are in separate buildings. You are a 20 minute ride from the Ferry to St. John and Red Hook. We rented a boat one day and explored the BVI's as well which was great but we couldn't wait to get back and hang out at the pool back at the Villa. There is plenty of space to hang out or host an event at Villa Viento. As a group, We have already booked next year as we enjoyed it so much. A special thanks to Amy who was awesome! Thanks Villa Viento!! Our family trip to St Thomas and stay at Villa Viento was wonderful! The villa and it's location was amazing, it did not disappoint. We were 6 adults and two small children and the spacious rooms were very accommodating. It had everything we needed and then some. While it was fun to enjoy one beautiful beach after another, we decided to hang out at the villa a day or two just to enjoy it's spectacular views and amenities. We were not bored. The property manager, Amy, met us at the airport as planned, and with a car seat in tow that we needed that she picked up for us! She was very helpful bringing us to the villa and showing us around the property. She made suggestions for sightseeing and even helped with contacts and reservations. At the end of the week when we found ourselves "stranded" on St Thomas due to a snowstorm that incapacitated JFK airport, Amy was right on it and found us a place to stay for another 3 nights! The unexpected move was seamless thanks to her. The only concern we had during our stay, was the steep driveway when it showered. It was a little touch and go getting our rental mini van up to the top! We kept an eye on the forecast though and if we suspected rain before we wanted to head out, we moved the car to the top of the driveway beforehand so we had no real problem with that. 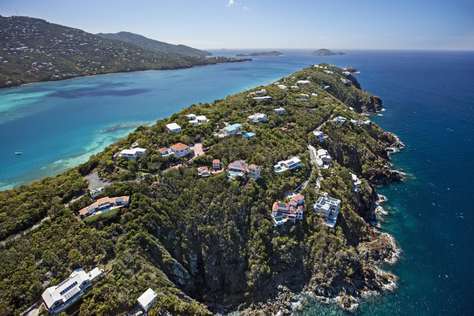 We would certainly recommend this property to others and rent it again should we return to St. Thomas. We were all a little sad to leave such a beautiful piece of paradise! Villa Viento was by far the most luxurious property that we have ever experienced! It exceeded our wildest expectations with its gorgeous setting and spectacular views. It is an expansive property with multiple buildings. 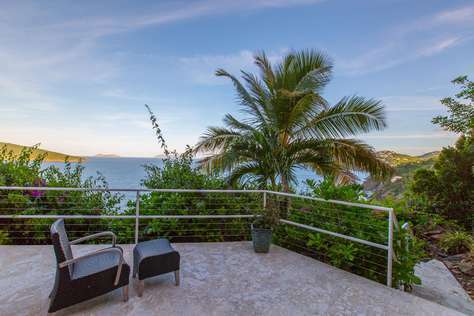 It has 5 bedrooms (some in separate buildings), which are all furnished very lavishly, each with incredible views of the ocean, surrounding islands and early morning sunrises. The large, gorgeous kitchen is very well equipped. The adjoining magnificent great room provides enough space for all to watch TV or visit. 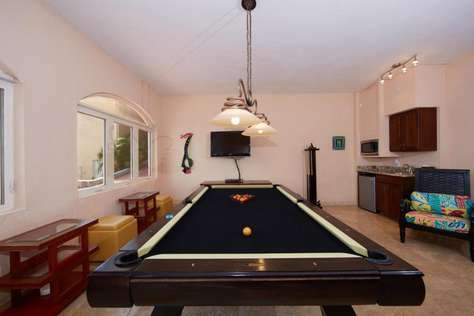 There is even a separate game room and a laundry room. The beautiful pool is the main attraction of the large outdoor area. The villa is in great condition and is very well maintained. There is truly nothing lacking in this luxury property. After staying here, our family will never want to go anywhere else. We were very spoiled with Villa Viento and its spectacular views and numerous amenities. It provides the perfect vacation in an idyllic setting. We truly felt like we were in Paradise every day and can not wait until our next visit there! Amy, the property manager, was awesome. She was very helpful in our planning of our trip, even met us at the airport, showed us around the villa and answered our many questions. She also provided excellent suggestions about restaurants, activities and beaches on the island. 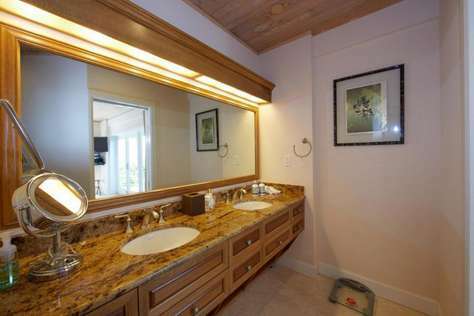 This property is just as breath-taking in person as it is reflected in the pictures. In fact, the views are so gorgeous, I never wanted to leave the property for sight-seeing around the island! Each of the bedrooms/bathrooms was so beautiful- it was hard to decide which one I was going to stay in. Each one was very spacious and had a fabulous view. I even slept with my window curtains pulled open so I would not miss the sunrise each morning (but it comes awfully early). The kitchen was fully stocked- from cooking utensils, spices, condiments, etc. even to a supply of liquor. It was so nice to have a fully stocked laundry room as well to wash our wet swimsuits and towels. Everything was in working order and very clean. My party loved to hang out by/in the pool or around the kitchen table playing games/cards. I will definitely miss the pool, the amazing views and the sounds of the native coqui frogs singing in early evening. This was definitely the nicest property I’ve ever stayed in. Amy, the property manager, was fantastic too. She met us at the airport, had our rooms ready, including the air-conditioning running in the rooms we would be staying. She’s fantastic to work with and always available for questions. Our party was very sad to leave. 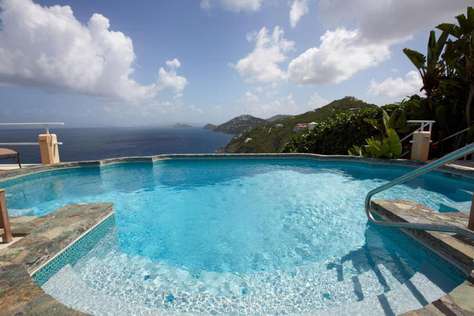 I would definitely come to this property again while in St. Thomas! Pictures on website are great, but to see and experience Villa Viento in person is pure heaven!! Sunrise views from bedroom, pool, main house were amazing. Close enough to water to hear the waves...and at night the sound of the Coqui frogs...unlike anything I've heard before! All the bedrooms and main room were decorated perfectly for this island villa-- we had quite the time deciding who would get to stay where. 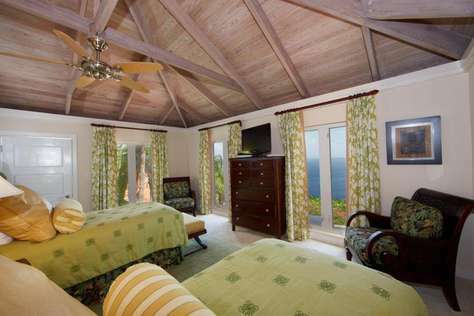 Each bedroom has its own key and private bath, perfect for several couples/families/friends staying here. I love that everyone could sleep as little or much as they wanted, as we would just gather at the main room and pool area when we were ready for the day--without worrying about waking up the others. This villa is spacious! There was sooooo much seating in the main house and patio/ pool area. Huge kitchen perfect for dining in! Huge TV in main house and large TVs in bedrooms as well. Pool was beautiful and clean….we had so much fun swimming/ playing/ lying on floats. Hot tub was down a level from pool, giving it much privacy. Gated neighborhood and then gated entrance to this villa leaves you feeling very safe. There was plenty of outdoor lighting around patio and pool. Every room had air conditioning. And having a laundry room for sandy clothes and wet towels and swimsuits was awesome!! So much better than dealing with all of that mess in a hotel! Everything seems new and clean in this villa, from furniture/decor to appliances. I can’t say just how impressed I was!! It was definitely a dream vacation----and I dream of returning one day!!! St. Thomas and St. John have gorgeous beaches- my pictures look like they have filters or have been photoshopped!! And they are just from my iPhone!! We visited Lindquist beach, Smith Bay, Trunk bay, Mountain Top, Paradise Point, Hawksnest beach, Sapphire Beach, Magens Bay, And our host/concierge Amy Dukes was great! In addition to beaches, she told us about this great bagel and coffee shop down the road that we ended up going to every morning- try every single specialty bagel sandwich!! So good! Oh and a homemade ice-cream shop nearby as well- must have the coconut!!! Very refreshing to have someone be so efficient and organized and respond promptly to any questions or concerns before and during the trip. You never know what you will get when you rent a privately owned place managed by a company, but this vacation went perfectly thanks to Sea Glass and Amy. I would highly recommend!!! Villa Viento is even more gorgeous than the pictures! We stayed for a long girls' weekend and did not want to leave. Villa Viento is a beautifully decorated and cared for home. 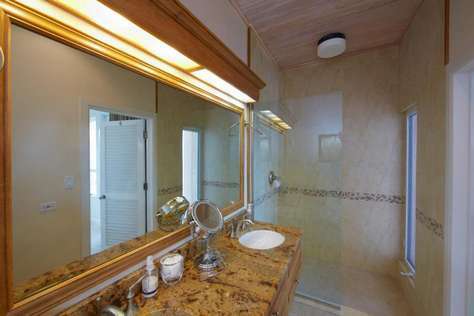 The property is spotless, exquisitely decorated, and comfortable both inside and outside. We were met at our rental car desk by Amy who helped us to the home, walked us through it and answered any questions we had. The pool is stunning, the outdoor lounge chairs are fabulous for sunning, napping or enjoying the amazing views. The bedrooms have comfortable beds, beautiful linens and pillows, plentiful bath and beach towels and gorgeous bathrooms. I love the location of the property because it feels so secluded and private but it is just a short drive to beaches, restaurants, markets and activities. The sunrise every morning is not to be missed and I can't wait for my next visit back to St. Thomas and Villa Viento! 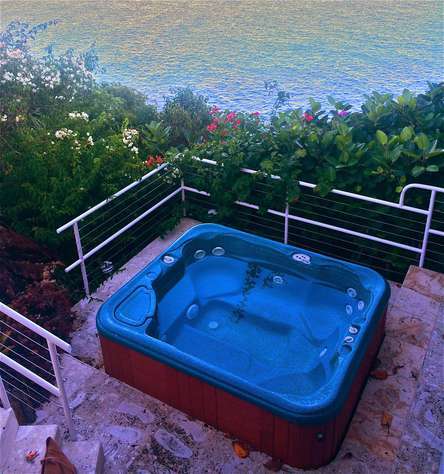 "Top notch villa on St Thomas!" 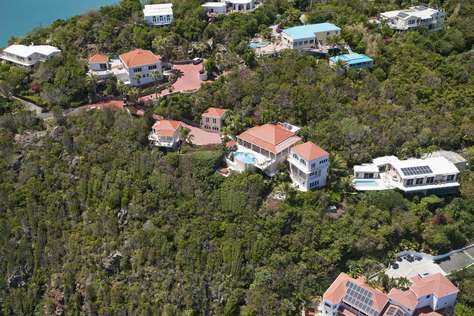 We have now rented multiple villas on St Thomas for many years. Each time we try to find one that is better than the previous and this year we were lucky enough to find Villa Viento. 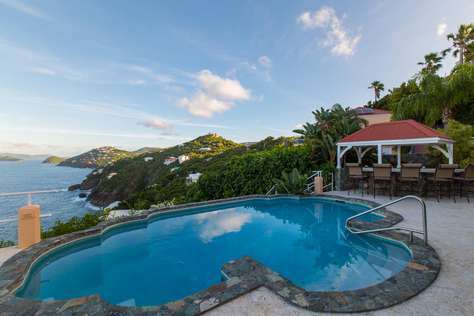 This property, which is located in a gated community in the Peterborg area of St. Thomas has fantastic views of the north side of the island which lends itself to great breezes in the summer. The rooms were all well appointed. The main living area was as good as any we have seen. We were also happy that the owners were not living either near or on property which is sometimes common with several villas on St Thomas. SeaGlass Properties was also very helpful in the entire process from pre-booking to arranging stocking the house with provisions to restaurant bookings and recommendations. Amy was a pleasure to work with during the process. 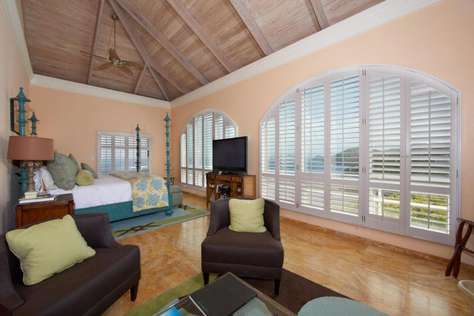 Our family of 8 enjoyed a vacation in St. Thomas and Villa Viento is just gorgeous. It is as lovely as the pictures depict and has all of the amenities one could want. Amazing sunrises greet you each morning regardless of the suite you are in and the views are stunning. All of the bedrooms are beautifully decorated and have lovely ensuite baths. The villa is fully air-condiitioned although it's always best to turn off the air in the bedrooms when leaving them for the day. The rooms cool down very quickly upon turning the unit on. There is always a very nice breeze as well; both day and night. The main house contains a large great room with ample seating, a gourmet kitchen , dining area and a half bath. The 80” TV allowed our 24 year old to “game in style” with his gaming console. 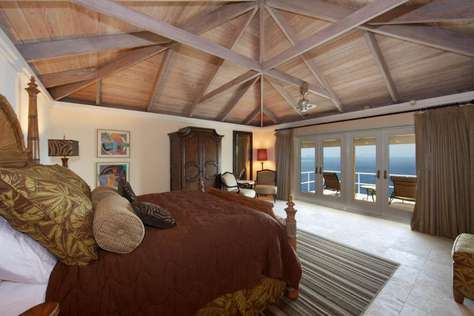 When facing the villa, a short walk across the breezeway leads to the master suite which is the only suite on the same level as the main home. A short flight of steps down leads to a second suite which is also quite large. Two additional short flights of stairs lead to the third suite which has the same amazing view, along with a private patio and another quiet, shaded sitting area. It is the smallest of the three rooms but that is the room we stayed in and we loved it! To the left of the main house is a two story structure with a game room on the first floor and a lovely suite with two twin beds on the second level. Directly in front of this is an additional building which houses the laundry room on the main level and a honeymoon suite on the second level. 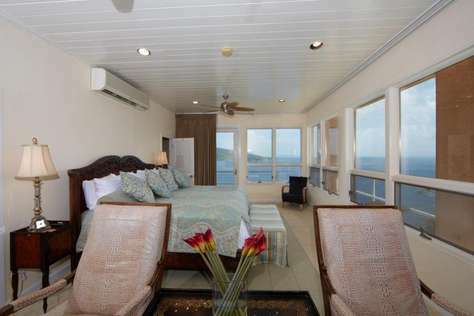 This suite is complete with a mini-fridge and private deck with chairs for lounging or sitting. 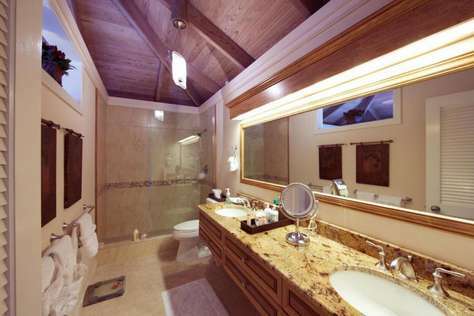 Villa Viento is a large property and while all suites are very close to the main house, there is ample privacy for all. The pictures on the website provide an idea of the "footprint" of the property. Don't worry about coolers, beach chairs, beach towels, or pool floats. They are provided as well as some basic snorkeling equipment. Nice to have on hand for day trips to the beach or other islands. The pool and verandah are perfect for time spent at home. Sun for those who want it and plenty of comfy seating for those who prefer the shade. Located in Peterborg, our advice is to rent a car - nothing is too far away and it's a short drive to anywhere on the island. A map, and remembering to stay to the left. will keep you on track and safe. Our concierge, Amy Dukes, was wonderful and much appreciated. She was attentive from our initial inquiry to greeting us and acquainting us with the property upon our arrival. She was also available to answer questions that we had during the week and responded very quickly. Amy suggested several of her favorite spots to eat, where to shop for groceries, who to use for a charter day trip, etc., and in general, made planning our trip and activities a breeze. We would definitely recommend Villa Viento to anyone considering renting a villa on the island - you won't be disappointed. We had an amazing time and knowing that each evening we'd be returning to a bit of paradise was a perfect way to end each day. 5 star service!! 5 star accommodations!!! My now husband and I live on St. Thomas but were looking for a villa for us to share with our family while they came down or our wedding. Villa Viento was amazing!! It was the best staycation we could have asked for!!! From the moment we contacted Amy we knew that this place was going to be the one! She was so sweet and helpful and had our families best interest in mind. The villa itself was just beautiful and there is nothing to descride the view! Once we checked into the villa, no one wanted to leave! It had everything we could have needed! We made great use out of the beautiful kitchen and the bbq grill out back and not to mention the outside bar! My husband and I were married at the villa and held our intimate, family reception next to the pool. It was truely magical! We hope to make it a family tradition to go back to Villa Viento for years to come! Thank you so much Amy for being awesome! First class five star experience! We went with the whole family (nine people) for a full week and this was a first class five star experience from beginning to end. The house itself is ridiculous and the photos from the web site do not do it justice. 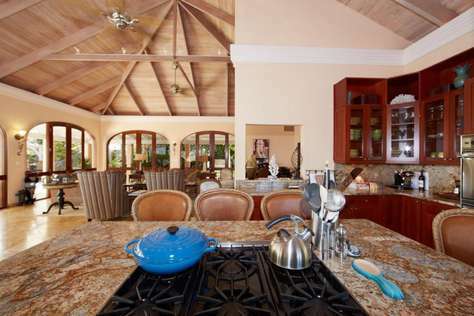 The great room and kitchen area of the main room are huge and luxurious, the cooking area is a chef's dream. The outdoor area is a paradise, pool and furniture are unbelievable and I can't even begin to talk about the view. Each morning you wake up to a sunrise view that was truly stunning. We started missing Villa Viento the minute we left. From the amazing pool/patio view to the special decorative touches in each bedroom, the villa was even better than the website photos. The layout was perfect to allow our large group to have privacy and an intimate feeling while still being able to congregate easily. The location was easy to find with stunning views from each room and excellent hospitality from our host. Can't wait to visit again! Breathtaking views and a perfect property layout!! Four words.... A Slice of Heaven! We stayed for an extended weekend and did not want to leave. By far the best views of the US & British Virgin Islands I have ever seen. Sitting in the infinity pool with the warm Caribbean sun shining down while overlooking the ocean makes you feel like you are truly in paradise. The house's accommodations are all five star and with 5 bedrooms there is enough space for everyone. I cant wait to go back to Villa Viento again next year. Oh My! After traveling all over the world for business, I can say that Villa Viento is one of the most spectacular properties I have ever seen. The layout of the property allows privacy for intimate settings as well as several large common areas for gathering. The upscale island décor is over the top elegant, yet functional and comfortable. The entire property was spotless inside and out and is extremely well maintained. And then you have the views which are breathtaking, always seem to change and never get boring. 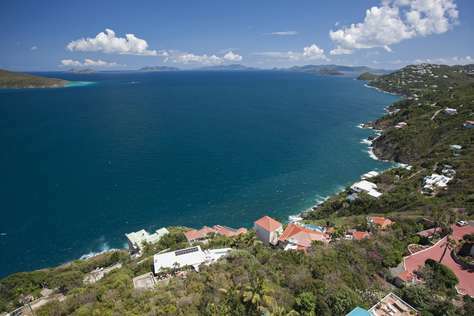 The property is perched on St Thomas with expansive views of St John and the entire British Virgin Islands. Words simply do not do this property justice. This was our first stay at Villa Viento, but certainly will not be our last! After an easy direct flight, property was one of the most beautiful privately owned places where I have stayed. Spacious, stunning views, clean and ready to relax and enjoy at arrival. 30 minute drive from the airport. Excellent restaurants within 15 minutes. You won't want to leave! Paradise with a Gentle Breeze! Out of all the places I have stayed in the world, Villa Viento is by far the best. 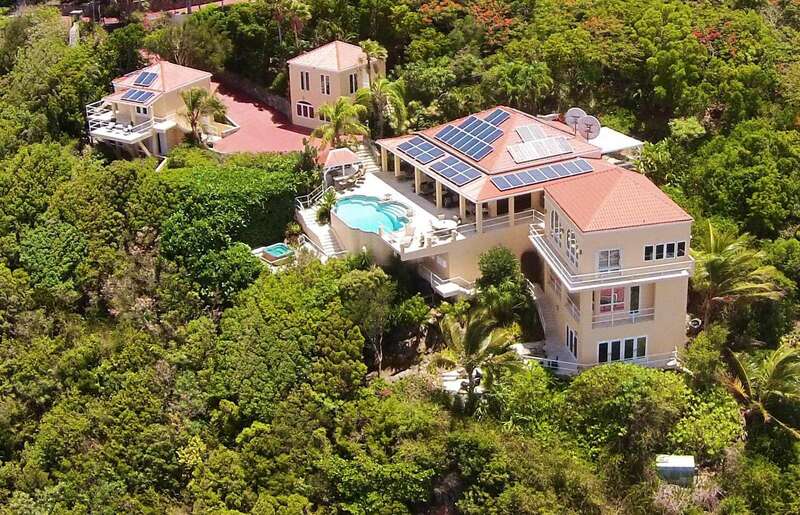 Villa Viento is a piece of paradise in St. Thomas. Luxury at its finest. All of the gems of the island are close by. Be it a beach, breakfast nook, fine dining, or shopping. All are a short trip away. We stayed there for 5 nights, and cannot wait to rent the property again. We had beautiful bedrooms and living areas, but the views were amazing. There was a real feeling of calm and relaxation. Having separate buildings for the others that were staying with us was great for the ultimate in privacy. Out of all the places I have stayed there has never been one that we regretted not renting the property for longer. That is no longer the case. I have found my favorite vacationing spot. Breathtaking does not suffice when describing this immaculate, beautiful, clean and stunning property. The views from the pool, the deck, the "honey moon" suite or the master bedroom are unparalleled. All the amenities are provided for either a once in a lifetime getaway, or an extended stay on the island. The five spacious rooms were clean and in perfect order. 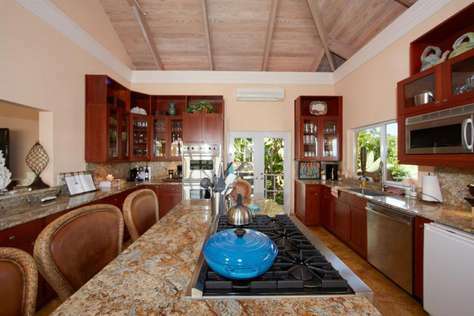 The kitchen has everything you need...from coffee to all you would need to prepare an elaborate meal. All you need to have the time of your life is a swimsuit and sunscreen...there's no need to go anywhere else. Thanks for the opportunity to stay at your wonderful vacation home. Wow....where do I start? This was the most amazing and beautiful location we have ever stayed. From the honeymoon suite with huge walk-in glass shower, to the game room with full-size pool table, to the giant 72" flat screen in the family room, to the giant glass doors & windows showcasing a spectacular view of the islands right off the back pool deck. I can't say enough about Villa Viento - just stunning. As far as entertainment & adventure goes, we were just a short drive to one of the most popular beaches in The Virgin Islands - Bolongo Bay Beach Resort. Great food, great live music, great entertainment including stilt walkers along with the beautiful views of the bay. If you have any scuba divers (even folks who are just interested in becoming certified and have never strapped a tank on) you can't go to St. Thomas without doing at least a 2 tank dive with Red Hook Dive Center. These guys are nothing less than top notch. The service and hospitality is second-to-none. We stayed at Villa Viento for a week but learned shortly after arriving that we wished we would've booked a longer trip. Needless to say, we are already looking at dates for next year. Can't wait!! Villa Viento is truly paradise. We spent a relaxing week here in early March and found it to be a very ideal spot for our vacation. The view is nothing short of spectacular and easily makes you feel that you have truly gotten away from it all. The villa, it's separate pods, and the incredible pool and deck area make it a beautiful setting as well as giving guests the ability to be all together or have a little alone time if they so desire. The location is great - about equidistant from Charlotte Amalie and Red Hook, the two commercial hubs on the island. We also enjoyed the close proximity of the beach at Magen's Bay. This is a place we want to return to and enjoy it with family and friends! We recently returned from a fabulous stay at Villa Viento. When we first arrived we were greeted by the most magnificent panoramic view we have ever seen. 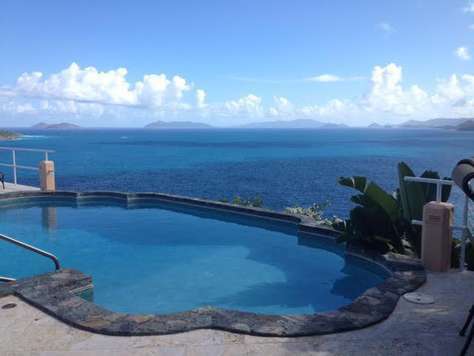 The tranquil pool over looking St. John and Virgin Gorda was a glorious retreat for us to spend the late afternoons. Because of Villa Viento’s location there was a continuous gentle breeze, which made resting poolside a relaxing treat. It’s hard to believe, but the interiors of Villa Viento matched the beauty of its exterior. 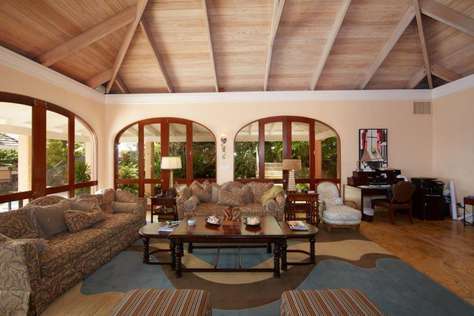 Each villa was meticulously maintained with gorgeous décor. The fact that we were just moments away from Magen’s Bay and minutes from exceptional restaurants made our vacation stay exceedingly complete. We would highly recommend Villa Viento; in fact, we are already planning our next vacation there.